My mom helped develop my interest in photography, and she averaged two 36-exposure rolls of film per week from age 65 to 75. I hope I am still active enough to take that many photos in my later years! I wasn’t able to convert Mom to digital before she died, but she enjoyed seeing instant photos on my first couple of digital cameras. 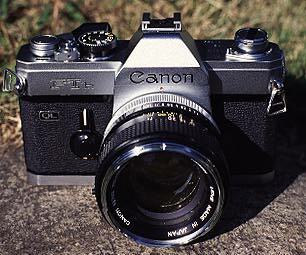 In high school, I saved my earnings from the grocery store where I worked to purchase a Canon FTb SLR, with a 50mm lens. This served me well, even through a dunking in the lake on a canoe trip. I added a Canon AE-1, which accompanied my wife and I to Guam, but its electronics got damp when our car was flooded during a typhoon. The car recovered, and the FTb, but not the electronic-based AE-1. I still own a Canon F-1 film camera that I found used while visiting Japan. I tried its shutter last summer, and it snapped crisply after sitting unused for over fifteen years! My first digital camera was a Sony Mavica that used two-inch floppy disks, with only about 240×360 pixels of resolution (0.8 megapixels). Next came a workhorse, the Kodak DC260, and then DC290. Then an Olympus C-5050, and eventually my first digital SLR, the Fujifilm Finepix S2. I still use the S2, as well as the newer Fuji S3 and S5. The S5 is built from Nikon’s D200 camera, but with a Fujifilm sensor that produces finer portrait color (like the old Fujifilm Velvia films – my opinion here!). My favorite digital camera research site is DP Review, where I enjoy the camera reviews, and the User Forums (particularly the Fuji SLR forum). I recommend this site as a starting point for buying a new digital cameras, including statistics on the cameras currently most-popular. I really enjoyed reading your post on cameras. That’s hilarious about your mother. Two rolls of film is a lot of film. She would have had a blast with a digital camera! My father was given a Brownie camera when he was a young boy and “wasted” all of his film on shooting a dog running across the road. His parents weren’t very happy about that, since they didn’t have much money and couldn’t afford to keep up with him. My own photography habits involved taking silly self-portraits with only portions of my face in the frame and various backgrounds in, well, the background! My parents always have to remind me to be serious when they’re about to take my picture. But it’s almost impossible! I’m like a honey-roasted ham on rye when a camera is aimed at me. But my favorite photography these days has to do with capturing unexpected moments on my digital camera. It’s an “oldie” and there’s this delay between pressing the button to take a picture and the camera actually snapping the picture. I’ve caught my cats with their tongues sticking out on several occasions because of this! So funny! Oh, did you hear that Polaroid film is no longer in production? If you Google it, you’ll find websites devoted to Polaroid memories and archives of Polaroid photos. Sad! Best wishes to you and your endeavors, Barry. Thanks for writing, hope all is well. Third time writing something here. First time, internet disconnected and lost my little story that I wrote. Second time, didn’t know that I had to answer the question. When I backspaced, everything was lost… man… such a hard life. haha. anyways, just want to say, cool blog, very interesting class you’re taking, and I hope you and your family are doing well. Very nice short history of your cameras! I love those old film cameras that just seem eternal! Right now I’m still using my Panasonic Lumix LX2 and am really enjoying it. It took some great pictures in my treks through London, Paris, Rome, Florence, Venice and Ireland this last year! Great blog, Mr. Lawrensen, I look forward to checking back! Hi Mr. Lawrenson! That’s cool to hear about the cameras. I enjoy taking pictures as well – but I’m not quite as good at it as others – I just enjoy having pictures of my friends to remember them by. Great to see your blog here! The story of your mother was great! My first SLR was a Russian Zenith. I upgraded to a Canon AE-1 when it came — it must be more than 30 years back. I still have it even though I haven’t used it for years. Right now I am interested in the Casio Exilim EX-F1, which has some interesting features, and also the Nokia N95 8Gb is on my wishlist. Wow. thats pretty amazing that the camera worked after 15 years and snapped the way it is supposed to. Im still using my D80, but I’m looking to upgrade within the year. Any suggestions? Carla Beth, I hadn’t heard that Polaroid pulled the plug on their film. That is a said end to the instant photo era. But I’m not too surprised, the instant print film was getting too expensive. Oh, Ahram, sorry to lose your wonderful little story. I know, that math test to be able to post is tough! Thanks for coming to see my new blog! Yes, Jacob, you have captured some stunning images in your travels the last year! Stefan, you don’t have to be a “pro” to enjoy taking pictures. Just enjoy it, and you are making wonderful memories. Haakon, I’ll bet the Zenith SLR would still work fine, if you still had it! Those old cameras were made to last forever. In contrast to much of today’s consumer electronics, that I almost hate to buy if I need or expect it to last for a few years! Nathan, I would look at the D300, and in a year or so, it should be down in price. But then there will be some newer model to tempt us! Didn’t see the question first time…lets try this again! Your blog is quite fascinating, Barry! Brings back memories of my very first 35mm which was a Pentax something-or-other! That was many years ago(probably 26-27)! Luke now has it. My latest is a Minolta maxum 500si which I have offered to Luke since I never use it anymore. Digital is just too convenient! Happy Easter from Kandern where spring has sprung! I really enjoyed reading your blog – thanks for sending the link! Not only did I learn something new, but the design is wonderful. Very well done! I loved hearing the stories about your history with cameras. The only thing I remember about my very first camera was that it was turquoise, a birthday gift, and didn’t work. How sad! My current camera is a Panasonic something or other that I bought before going to Oman for its 12x zoom. I knew, from talking to past students, that most of the sites were far away and that with their little zooms they missed a lot of photos. It did me well, and still clicks away even after being dropped in the Arabian desert and getting ocean water splashed all over it. My only complaint at the moment is that it’s too big just to stick in a pocket for an “average” day snapping pictures. Still, I’m happy with it! Have a wonderful week Barry! Hi, Barry, You have a very impressive blog. Congratulations. You are way ahead of me on technology issues. Thanks for you birthday note. I have been meaning to get back to you, especially about the wedding shoot. I’m not sure if I’ll be able to make it up there for it. But thanks for thinking of me. A lot of good info on this blog. I’ll have to try the defrag. Sounds German “Auslogic” Good luck with the class. Nice site. Shortly after Susan and I were married and she began working for Pentax Corp. as a regional sales manager for 10 yrs. This is when I got hooked on photography. And then when I saw the portraits of Karsh and the landscapes of Ansel Adams, I fell in love with B&W and took a Photography 101 class in the community college in our town. I enjoy my new digital Pentax, but miss working in the darkroom. I always said I was going to have a darkroom in my home some day, but by the time I had a home that would accommodate one, we entered the digital world. I would love to someday be able to duplicate the saturation and tones from doing my own developing. Maybe when I spring for some good software I’ll get closer. And by the way, I fell in a creek in rural Illinois carrying my 2 year old nephew and gave my K1000 a nice dunk, too. And it also survived.